Dealing effectively with uncertainty requires today's project manager to be familiar with a broad spectrum of strategies, encompassing both 'hard' and 'soft' methods. This theme of unified thinking (i.e. the need to selectively draw upon a wide range of strategies in any given situation) will differentiate the book from its contemporaries. By picking up where traditional risk management techniques begin to fail, it brings together leading-edge thinking from a variety of disciplines and shows how these techniques can be used to conquer uncertainty in projects. The ability to make good decisions when faced with uncertainty is the real challenge. It is a universal truth that a decision is only as good as the information it is based on. But good information is often hard to come by, and all projects are vulnerable to the unknown and the unknowable. Thus, uncertainty becomes the sworn enemy of the project manager. Wherever we try to analyse, quantify, plan and act, uncertainty lies in wait to surprise us with its ambiguity and unpredictability. It lurks in every stage of the project lifecycle: in the planning (how long will this really take? ), the initiation (this isn't the situation I expected! ), the execution (who could have foreseen that happening? ), and even the completion of a project (where are the expected benefits?). But managing uncertainty is a lot more than just applying risk management techniques. It requires a deep appreciation of how uncertainty arises and, by recognising its different guises, the appropriate strategies can be formulated. If we can learn how to reduce uncertainty, we can make better management decisions and increase the chances of the project succeeding. 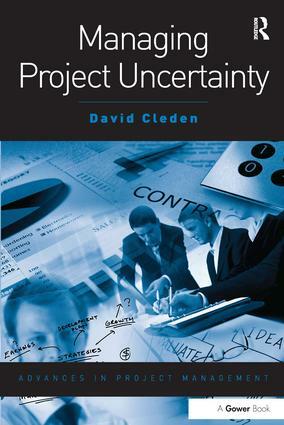 This book addresses five key questions: ¢ Why is there uncertainty in projects? ¢ How do you spot the symptoms of uncertainty, preferably at an early stage? ¢ What can be done to avoid uncertainty? ¢ What strategies can be used to deal with project uncertainty? ¢ How can both the individual and the organisation learn to cope more effectively in the future? The reader is assumed to be a either a project management professional, or a senior manager looking for ways to improve project management strategy within their organisation. As such, a foundation in project management basics is assumed, although not essential. The book then builds on this by exposing new ideas and concepts, and shows how these can be harnessed to tackle uncertainty in its many guises. Contents: Preface; Living with uncertainty; Uncertainty in project and programme plans; Problem-solving strategies for managing uncertainty; Knowledge-centric strategies; Anticipation strategies; Resilience strategies; Learning strategies; Glossary; Bibliography; Index. David Cleden is a senior consultant for Northgate Information Solutions, a provider of specialist IT services to the public sector.